In February, I missed 2 flights because the flights left even earlier than 20 minutes before scheduled departure. Read the story & my advice on catching AirAsia flights here. 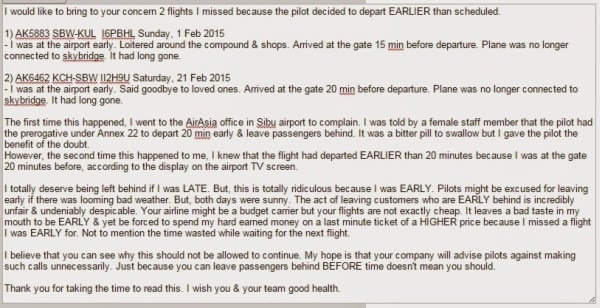 I thought that it was unfair for passengers who were early to be left behind so I wrote the following feedback & submitted it via the AirAsia contact page on the 21st of March. A stern letter reflecting my sentiments of the practice. On the 26th of March, I received a reply. A rather disappointing reply from a multinational corporation. On another note, check out the exemplary email I got from FoodPanda. This email seems like a generic cut & paste email they send to everyone who complains about missed flights. Half of it was pure terms & conditions. 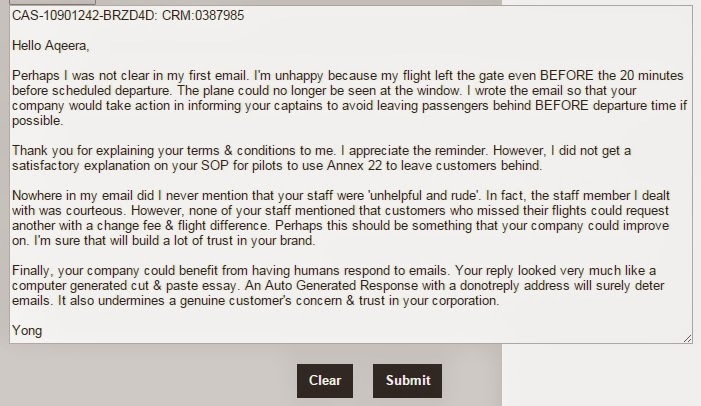 They could have made it better by using specific information from my feedback in the introduction (like the flight numbers & specific concerns) to make this email seem less generic or computer-generated. They didn't address any of the points I brought up. There was no mention of an investigation. No mention of the Annex 22 I brought up. I was falsely accused of writing that their staff was 'unhelpful and rude'. I did no such thing. This sentence needs proofreading: "Since you have missed flight, our staff had offered our service by charging a flight difference with change fee instead of buying a new ticket which would cost more expensive." No follow up action. I didn't write in to demand an apology. I wrote in so that they would take action. At least investigate my accusations, explain the policy on leaving passengers behind before scheduled departure or have a message sent to pilots to avoid leaving early if possible. Still, I got something useful from this email. I learned a potential way to save money when an AirAsia flight is missed. We can get another flight at the ticketing counter by only paying for the Change Fee + Fare Difference. Saving on Airport Tax & other surcharges. However, if you got your flight early & really cheap, this method might cost you more. Therefore, it's worth it to check out the prices of new flights from every airline & compare it to the total of the Change Fee + Fare Difference. 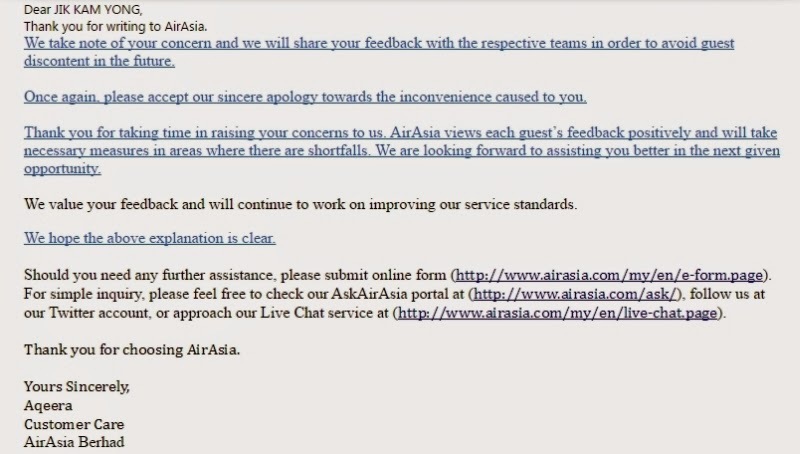 Because I felt that they didn't resolve the issue, on the 28th of March, I wrote this reply on the AirAsia contact page. I could not reply directly because AirAsia uses a do-not-reply email. This airline makes it a hassle for people to send them mail because it is likely that they get A LOT of complaints. However, we should not be deterred by the hassle to write in to help this corporation better serve our needs. Since we are willing to give them our money, we should also give them our requests so that our money is well spent. They will only take action when there are a large number of similar complaints/requests (especially if they do not make or save any money from doing it). This corporation has its roots in Malaysia. My hope is that it'll be a corporation that we can all be truly proud of. 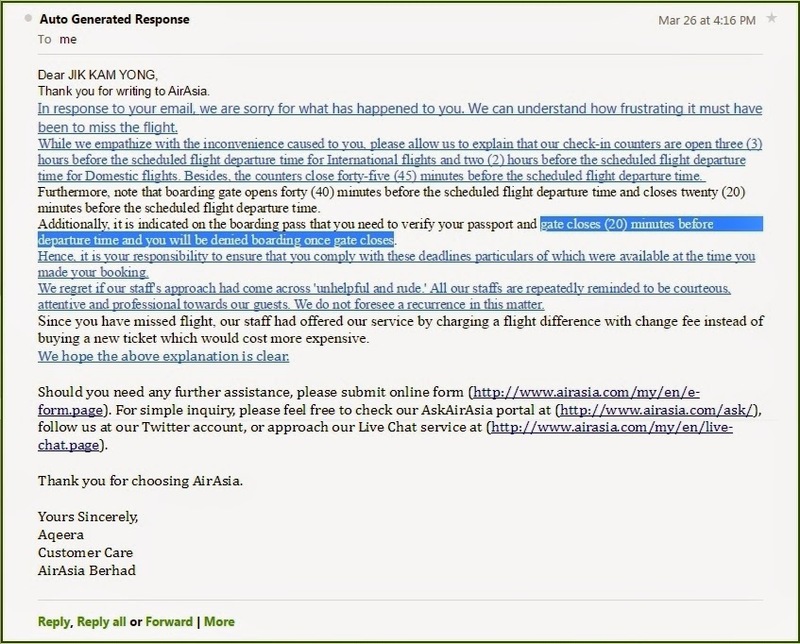 Update: AirAsia responded with more of the same almost a month later on 21 April. I've made my case & I'll let the matter rest. At least they'll share my concerns with the respective teams.